The personal rule of Louis XIV, following on from a long period of royal minority and apprenticeship, lasted 54 years from 1661 to 1715. But the second half of this personal rule has, until recently, received significantly less scholarly attention than the 1660s and 1670s. This has obscured some of the very real changes and developments that occurred between the early 1680s and the mid-1690s, by which time a new generation of younger royals had come to prominence, France was engulfed in international war on a greater scale than ever before, and the king was visibly no longer as vigorous or healthy as he had once been. 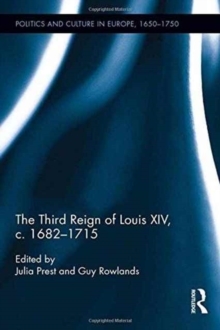 The essays in this volume take a close look at the way a new set of political, social, cultural and economic dispensations emerged from the mid-1680s to create a different France in the final decades of Louis XIV's reign, even though the basic ideological, social and economic underpinnings of the country remained very largely the same. The contributions examine such varied matters as the structure and practices of government, naval power, the financial operations of the state, trade and commerce, social pressures, overseas expansion, religious dissent, music, literature and the fine arts.